Florence gallery-guides.com - Florence, Italy art galleries guide Florence Galleria degli Uffizi information about open hours, admission charges, River Arno, masterpieces, historic paintings, Medici art collection, San Pier Scheraggio, Vasarian Corridor, location and address, tel / telephone number, and general information about Uffizi Art Gallery in Florence (Firenze) area, Tuscany, Italy (Italia) IT - Last updated 30/10/2012. 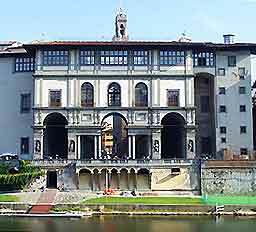 Florence's famous Galleria degli Uffizi (Uffizi Gallery) leads all the way down to the banks of the River Arno and the impressive collection of art work is arranged to illustrate the historic of Florence art. The Galleria degli Uffizi (Uffizi Gallery) houses many famous masterpieces, such as Botticelli's Birth of Venus, Titian's Venus of Urbino, Michelangelo's Holy Family and Piero della Francesca's Duke and Duchess of Urbino. Florence's Galleria degli Uffizi also contains the extensive Medici art collection, bequeathed to Florence in 1737. The Uffizi Gallery remains one of the most important art galleries in the world and has become a major tourist attraction in Florence and Tuscany. Other attractions at Florence's Galleria degli Uffizi include the ancient church of San Pier Scheraggio, the Tribune room, the Medici Theatre, the Room of the Maps, and the Vasarian Corridor - a covered passage which stretches for around half a mile, connecting the Uffizi Gallery to the Palazzo Vecchio and the Pitti Palace.